Explain about import registration process, cargo movement to Morocco from overseas countries, Import delivery process in Morocco etc. How to import to Morocco? 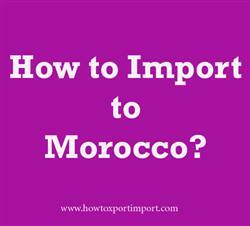 What are the import procedures in Morocco to move goods? Detail the import methodology in Morocco. This post explains about step by step procedures that need to be finished with Morocco government authority for importation to Morocco. Any legal person who has registered with Tax Authority of Morocco can start appropriate business and engage with international trade by fulfilling necessary requirements by the Government of Morocco. For commercial purpose, a registered trade with concerned license (if required) as per the business and have enlisted in the Trade and Company Register of the country is must for exporting and importing of goods from and into Morocco. A license representing the “physical import or export” is required for all imports and exports. Customs and Excise Administration under the ministry of Economy and Finance of Kingdom of Morocco is in charge of the collection of customs and duties taxes, of excise taxes and quasi-taxes, the fight against the illicit traffics and with the control of the goods and with the persons at borders, Customs saw confiding new missions of strong economic and security stakes. The import documents required in Morocco depends up on the regular trade policy of Morocco Government, the nature of goods importing, specific goods importing to Morocco. Understanding the right documents is essential for smooth import and export procedures. Any delay in filing or absence of documents can delay the clearance process and thereby importer supposed incur demurrage on the imported cargo but also stand to loose business opportunities. This post explains about different phases in import process that every importer needs to go through in Morocco. Methods to import to Tetouan. Guidelines to import to Oujdai Please guide to import to Marrakech. Customs requirements in Laâyoune to import. Customs needed to import to Dakhla. Procedures required to import to Rabat. Requirements to import to mm Oujdamm. Clarifications to import to Dakhla. How can I import to Tangier. How can I register to import in Tetouan. What Licence requited to import in Tangier. What should I do to import to Oujda. How to import to MELILLA? Documentation procedures for import at Tetouan customs. What are the documents need to be submitted to import at AGADIR port customs. Procedures to import to CASABLANCA. Need to import to AGADIR. Explain to import to Marrakech. Information to import to Oujda. Step by step process to import to Marrakech.